If you click the image below, you'll be taken to the Student Guide to Social Media. This is an interactive online resource, giving information on various social media platforms, and on tasks you can accomplish using social media - it is aimed primarily at undergraduates but has applications across the board. It is made available under a BY-NC-ND Creative Commons licence: in other words if you think this resource might be of use to YOUR students, feel free to use this, link to this, make it part of your own institution's website, just as long as you credit the creators (the BY part), aren't using it for commercial purposes (the NC part) and use it entirely as it is, in its current state, rather than creating your own version or derivatives (the ND part). Alternatively, book mark libassets.manchester.ac.uk/social-media-guide/ or click the link to open the resource in a new window. The resource is the result of a joint project between the Libraries of the Universities of Leeds, Manchester and York, developed over the Summer. Michelle Schneider from Leeds' very successful Skills@Library team approached me about working together on a social media resource for undergraduates - I was extremely pleased she did, because it was something on my list to do anyway. There's a lot of support out there for postgrads, academics, researchers generally in using social media, but I don't think there's as much for undergraduates. It's an area we're looking to expand at my own institution, and as well as face-to-face workshops I really wanted something that worked as an interactive learning object online, probably made using Articulate / Storyline. Imagine how pleased I was, therefore, when Michelle told me the other collaborators would be Manchester, including Jade Kelsall, who is absolutely brilliant with Articulate! I'd worked with Jade before at Leeds; she provided all the technical expertise to create the Digitisation Toolkit (using the Articulate), one of the parts of the LIFE-Share project I actually enjoyed. Also on the team were Carla Harwood at Leeds, and Sam Aston at Manchester. Increasingly as I do more and more teaching, training, and planning, I'm aware that when introducing people to new tools (or trying to help people use existing tools better) you have to give them two different versions of the same core information. The first and obvious thing is how to use a tool - e.g. here's Twitter, here's how you create an account, here's some tips on using it. But this assumes some prior knowledge - what if you don't know why you'd need Twitter? So you also have to present the information in terms of tasks people want to achieve: "I want to boost my professional reputation" is one such task, and Twitter would be among the tools you might recommend to achieve this. The great thing about using Storyline is we can do exactly that - students can explore this resource by tool, or by task, or both. The resource is, deliberately, very straightforward. We stripped out everything non-essential to give students easily digestible, bite-sized introductions to the various things they might want to use these tools for (Twitter, Facebook, LinkedIn, Slideshare, Google+, Academia.edu, blogs etc). It's also relatively informal without attempting to be in any way cool or streetwise. I've showed it to some of my students in info skills classes already and it's gone down very positively; I think even students who are very au fait with web 2.0 tools still appreciate some guidance on how to meld the social with the academic and the professional. 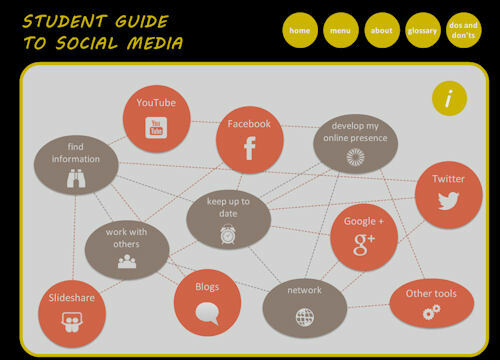 So, check out the Students Guide to Social Media, tell us what you think, and if you'd like to steal it, feel free.